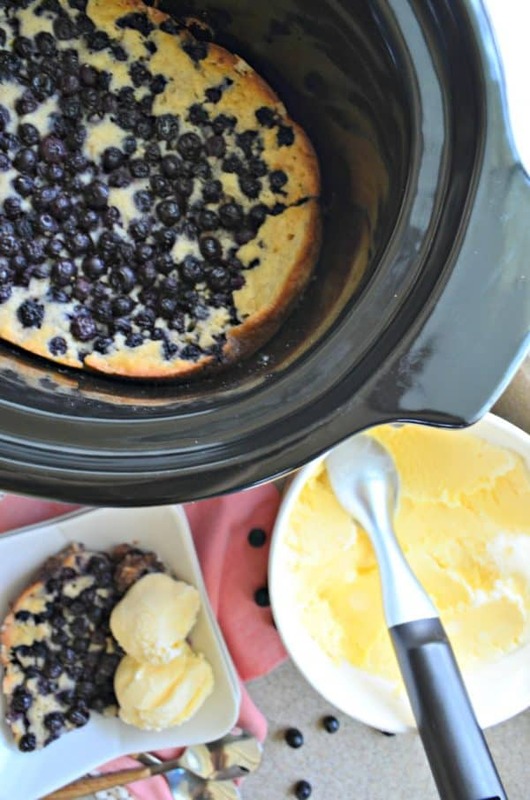 Prep dessert before your guest arrive and treat them to Slow cooker blueberry cobbler! Don’t forget the vanilla ice cream to make it a summer time treat! Summer is in full swing and blueberries are in season! 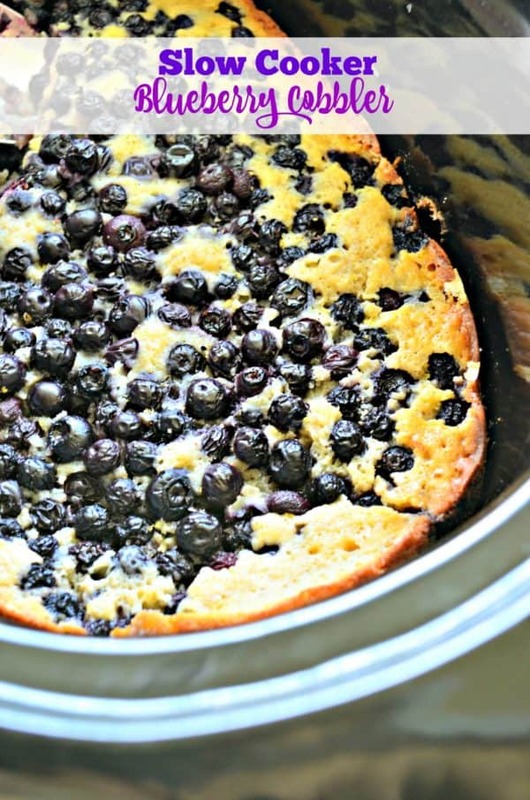 What better way to use them up then to make my slow cooker blueberry cobbler! The best part is that it takes only 10 minutes to prep and only two and a half hour to cook in the slow cooker. I like to make cobbler in the slow cooker when I know I have guest coming over for dinner. I can quickly prep dessert and it will be done in time for my guest to enjoy! All you have to do is scoop out the cobbler and add a scoop of vanilla ice cream! This is one of my favorite summer time treats. 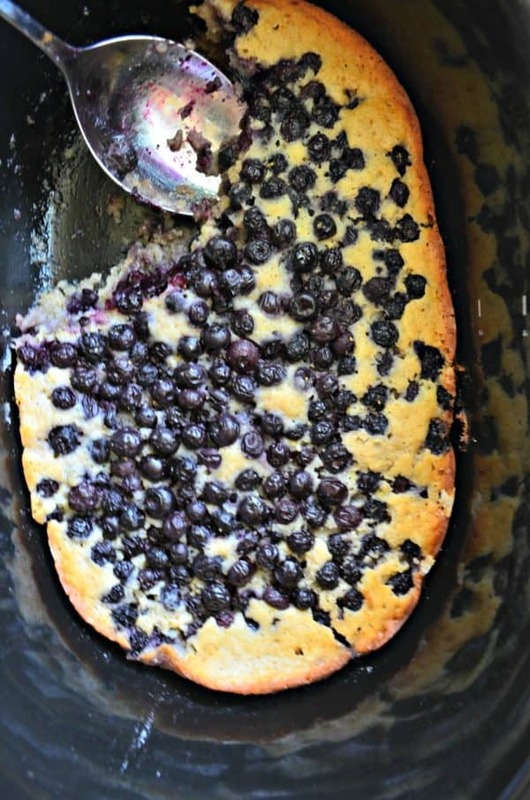 I like to use fresh blueberries for this recipe since they are in season. However, if you want to make this recipe when blueberries are not in season you can also use frozen. Either way works well. And you might think that a cup of sugar is way too much for the blueberries. I promise it’s not. Go with your gut and follow the recipe as its intended. You’ll be happy you did. I promise! Anytime your making dessert in the slow cooker you always want to make sure you coat the slow cooker really well with non-stick cooking spray. I love to use coconut oil cooking spray. It doesn’t mess with the flavors as much and it adds a subtle sweetness to the already sweet dessert! Once you’ve sprayed the slow cooker it’s time to make the batter for the cobbler. I don’t use a mix, I use ingredients I have on hand and I feel it doesn’t take that long to mix together. Once the batter is mixed pour it into the slow cooker. Using a spatula spread the cobbler batter so it reaches all edges of the slow cooker. Then, wipe the same bowl out that you mixed the cobbler batter in and mix together the blueberries, sugar, lemon juice and lemon zest. Carefully mix then pour it on top of the cobbler batter. That’s it! Place the lid on the slow cooker and set it to high for two and a half hours. 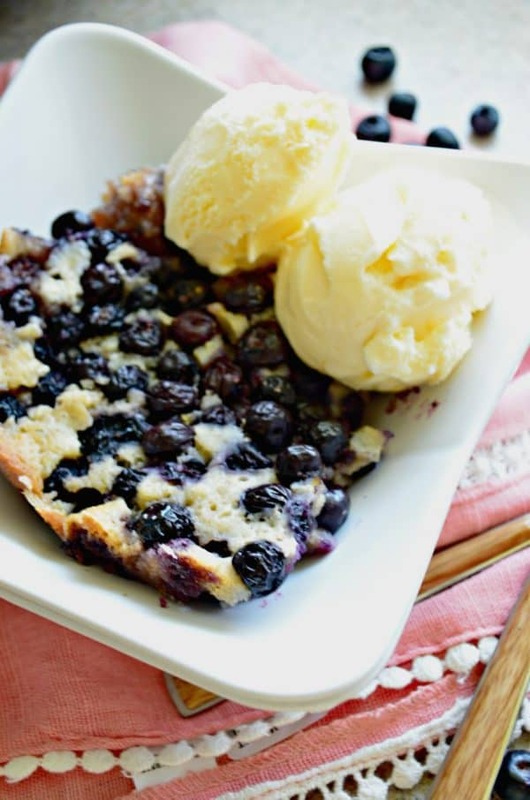 Once your cobbler is ready, spoon it out into bowls and top with vanilla ice cream and more fresh blueberries if you want! If you’re looking for a delicious summer dessert enjoy the fruit of the season and make my recipe for slow cooker blueberry cobbler!